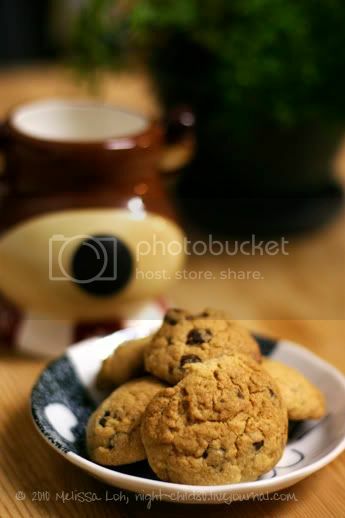 The chocolate chip cookie is a classic and perfect for sharing around the office or with girlfriends over tea/coffee. So perfect I made three batches of them: one for the SO to take to work, one for me to take to work and one reserved for ourselves. And the icing on the cake - or in this case, the chocolate chip on the cookie - it's so dead simple, the SO now knows the recipe by heart and is happy to mix everything together. That's what you use if you don't have a KitchenAid® Mixer - go old school with manpower. I should also add these are addictive! Beat the softened butter, sugars and vanilla extract for 1-2 minutes or until smooth and well combined. Beat in 1 egg before stirring in the flour. 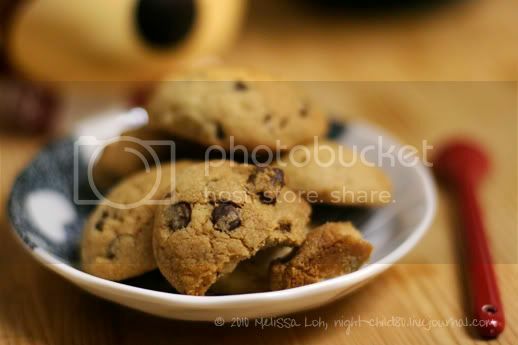 Once smooth, fold in chocolate chips until evenly distributed. Spoon teaspoonfuls of the mixture into balls and place on the lined trays with space between each. Interesting, all my recipes measure butter with the liquid measurments. Liquid? Like in quarts? How do you measure butter out then? We get butter in blocks wrapped in paper, with markings for 50 and 100 gms. So it's easy peasy to whip them out of the fridge, slice out the amount you need without a scale and put the rest back in. I dunno. I guess us Yanks like measuring butter by volume with tablespoons (TBSP) or cups. Looking at my sticks again, the fine print says "equal to 4 ounces or 113 grams". See, I don't get the 'sticks' unit of measurement. What on earth is a 'stick of butter'?? BTW, I haven't heard H.O.T's songs in ages. I think I need to dig through my external hard drive to find some to listen to! They are yum! And they keep at least a week, so you don't have to worry if you don't get the chance to eat them right away. *LOL* I ripped my sister's CDs when I was last back in Singapore, including her Korean boyband stuff. But I've never been much of a k-music fan. Nonetheless I highly recommend DJ Masa's mash-ups. Oh, these look absolutely gorgeous. And wonderfully simple too. Am now half-tempted to try making them while home, though I'll probably have to experiment with different times using the toaster oven instead. Hm. I hope you don't mind a question from the baking ignoramus: Did you have to grease the baking paper/parchment before use? You don't have an oven at home? I'm not sure how well they'd work in a toaster oven, since you won't be able to control the temperature very well. And no, you don't need to with the butter content in these. I would recommend that as they cool, you move them around the paper while they're still malleable (but not so hot you burn your fingers), so they don't stick.